Bus from Singapore to Taiping is gaining popularity in recently years among working adults and students from Taiping. Passengers prefer bus over train because train from Singapore to Taiping is non-direct train service. Passengers need to travel from JB Sentral to Gemas by older generation train before transferring another ETS train to Taiping train station. StarMart Express, Seasons Express and Billion Stars Express are the few bus operators supply daily bus from Singapore to Taiping. StarMart Express is the dominant player between them by providing up to 10 daily departures from Singapore to Taiping. Bus services from Singapore to Taiping are available either in the morning or in the evening. Kindly take note that there is no bus service in the afternoon between 12pm to 6pm. All the coaches are fully equipped with air-conditioning, spacious and reclining seats to ensure passengers having comfortable journey from Singapore to Taiping. The bus fare from Singapore to Taiping is ranging from SGD 30.00 to SGD 38.00, depending on the choice of bus operator. Duration for bus from Singapore to Taiping is usually takes about 8-9 hours, depending on the traffic condition. At least 1 Washroom break will be provided during the journey because all buses in Malaysia have no toilet on board. For bus from Singapore to Taiping, there are 3 departure points in Singapore, namely Golden Mile Complex, Boon Lay Shopping Center, Park Royal in Little India. The coaches usually stop a few points in Taiping like Kamunting Bus Terminal, Taiping Bus Terminal and Simpang Taiping. 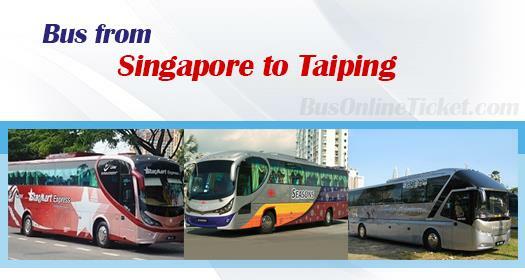 Due to high demand for bus service from Singapore to Taiping, passengers are advised to book your bus ticket online early with BusOnlineTicket.com. With convenient online booking service and various choices of bus operators and departure points, this makes BusOnlineTicket.com become one of the most popular online booking portal among its customers throughout these years.